As part of its commitment to support civic education and engagement, the Santa Clara County Office of Education is partnering with key community stakeholders to help students “learn, engage, and take action” to increase civic literacy. 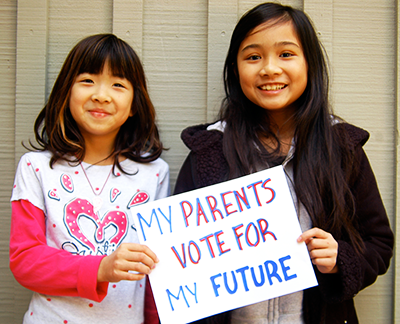 The goals include incorporating the recommendations of the California Task Force on K-12 Civic Learning and provide professional development and share best practices with educators; provide hands-on learning opportunities for students to participate in upcoming elections by coordinating age appropriate contests in multiple languages; and engage key stakeholders, including parents and community members, in the democratic process. Research shows that robust civic learning helps students beyond the classroom – giving them opportunities to analyze, address, and ultimately have a hand in solving complex issues that are important to them and those around them. Furthermore, research findings correlate high-quality civic learning to increased academic achievement, student engagement, and reduced dropout rates. This initiative directly supports the goal from the Framework for California Public Schools that, by high school graduation, students will have developed the readiness for college, careers, and civic life. To act as informed voters, serve as responsible jurors, and participate in policy making decisions, students need the knowledge and skills to interpret and communicate ideas and negotiate and collaborate in ways that positively impact democratic policies, practices, and other people’s lives.